It's always gratifying to see a band progress. I reviewed Gilded Lily's blast of rage just a little over a year ago, and they're already back with a full length that finds them making a huge leap as a band. Mongrel's Light is a more focused and powerful album in almost every way. The sound is dark and heavy, the production is better, and a clear lyrical theme runs throughout. But don't mistake that change for the band losing any of their original fire or chaos. The heart of the band is still black-ish-grindy-death-y metal, but they're in no way afraid to take a sharp turn when they want to. "Bellflower," a song with a deceptively pretty name, starts out with galloping black metal, but eventually throws out some sweet guitarmonies before moving into a doomier section. "A Spare Room" recalls some of the unhinged sounds from the first EP. The sound fittingly puts one in mind of someone screaming into a nearly empty room, be it as a result of imprisonment or worse, while the guitar and bass--at least at first--lay relatively low next to a layer of static, ultimately breaking out and sharing space with a cleanly sung line that sounds both angelic and haunted at the same time. Does this person need to defend themselves, or are they looking for violence? Clearly Gilded Lily has taken their lyrical game way up, but both the EP and this new full-length reward listening with the lyrics in front of you. The energy, the filth, the poetry. All of these make this a band to continue to watch. 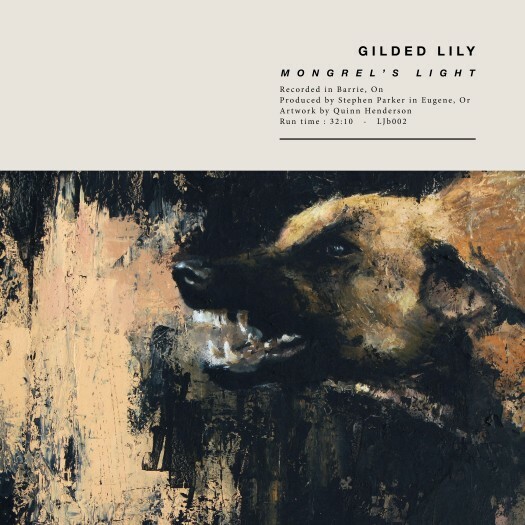 Mongrel's Light is a quantum leap ahead for Gilded Lily, and I can't wait to see what they do next.